After my basic nail prep, I applied three coats of VDL’s Festival Nails in Violet Stiletto, a pale, fresh lavender shade. Side note, I love this color so much that I did a pedicure with it as well! Anyway, I used three coats because they didn’t initially cover as evenly as I wanted, but three coats gave me the perfect look. I was really in the mood for a matte manicure, so I applied one coat of NYC’s Matte Me Crazy to each nail. If I liked Violet Stiletto before, I loved it now. The matte finish really made this color pop. 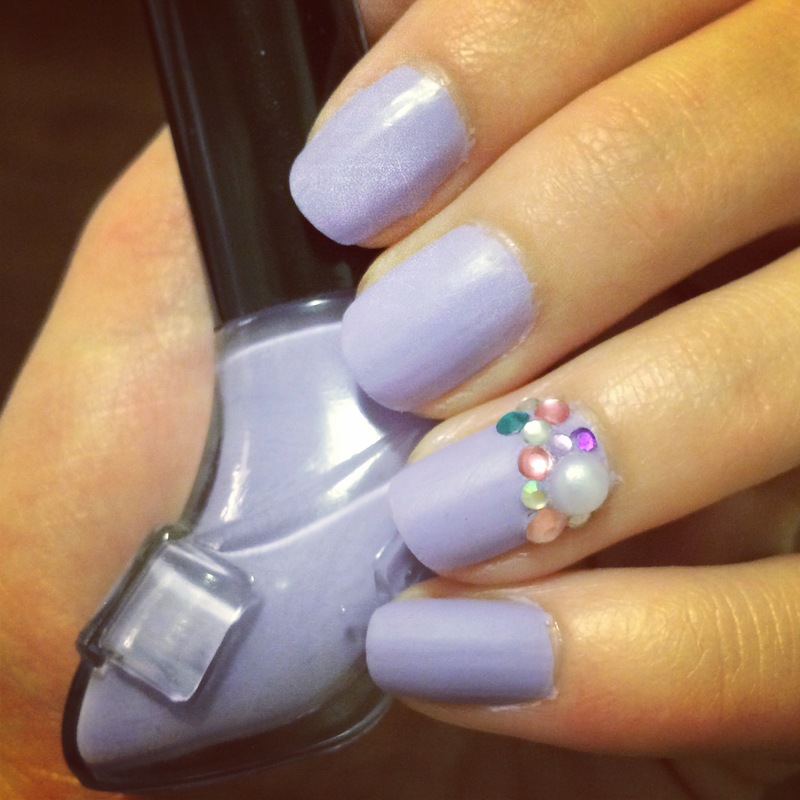 I still had a mix of different colored rhinestone and pearl nail studs from a previous Nail Art Society kit, so I applied a few to each ring finger for a cute accent nail. I applied a dot of NYC’s Matte Me Crazy before each rhinestone. Top coat is the perfect adhesive for nail studs, but since I created a matte look, it was important to keep the look matte. After applying a bunch of different studs to each accent nail, I sealed them all in with another coat of Matte Me Crazy. Do you think this look is pretty glam? This is a gorgeous color. Love what you did with the stones. This really makes the manicure pop. Thanks for continuing to share all your great ideas.